Welcome to the Recipe Development Laboratory, Dahlings. 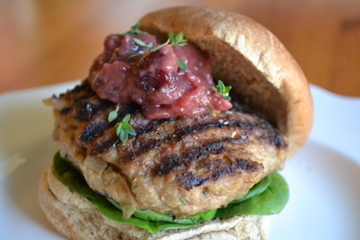 Today we are creating deliciously seasoned burgers made with turkey. The Fam (a focus group,) are my toughest critics. They never even consider holding back just to be polite or diplomatic. Sometimes I like that about them. Okay, no... we're NOT making turkey meatloaf. Just trust me. Remove meat and egg from fridge to come to room temp. After chopping onion, place in melted butter in a non-stick skillet on medium heat. When onion starts to be a bit translucent, add minced garlic and turn heat to low and slow. Sprinkle with sugar and salt. Cook for another five minutes, then remove from heat. This, Class, is called caramelization. Place egg in large mixing bowl and beat with a fork to blend. Add Worcestershire, Tabasco, Dijon and milk. Mix with fork, then toss in turkey, panko and herbs. Sprinkle with salt and freshly ground, black pepper. Add the onion and garlic to the bowl. Roll up you sleeves and get into that burger mixture with your hands. Be sure all is well blended. If you have a kitchen scale, weigh out each burger at four ounces. If not, just divide the meat evenly for the amount of burgers you need. Shape into patties and place on a flat pan or plate to rest. I attempted to cook a test burger on my George Foreman grill, but it stuck. Badly. Turkey is fairly lean. Maybe that's it. I did try to open it before it was done. Just to get a look at its progress. Oops. Anyway, I turned to my stove-top, cast iron grill pan. It worked like a dream! I seared the burgers until brown and crispy on the outside. I then finished them in the oven for about ten minutes to make sure they were done. I already had the oven on, baking some oven fries to go with the burgers. The spinach was favorably received... Well, one healthy thing, at least. And the turkey, of course. I must report that I loved all of the components of my experiment. Each item contributed to the finished product. In other words, everyone played well together. 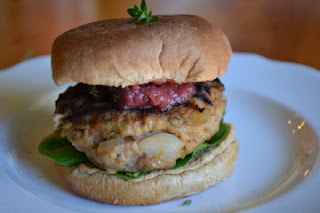 The herbs and other spicy notes gave it a nice flavor, but didn't overpower the overall burger. The sweetness of the onion made it melty-good in my mouth and retained a tiny bit of crunch. I think I'll try it with Swiss and turkey bacon next time. I'll let you know how it goes.